Captain Alexandra “Sandy” Pollard, USNR (Ret. ), 73, passed away at Chesapeake General Hospital on March 22, 2019. She was born in Trenton, NJ on June 6, 1945. 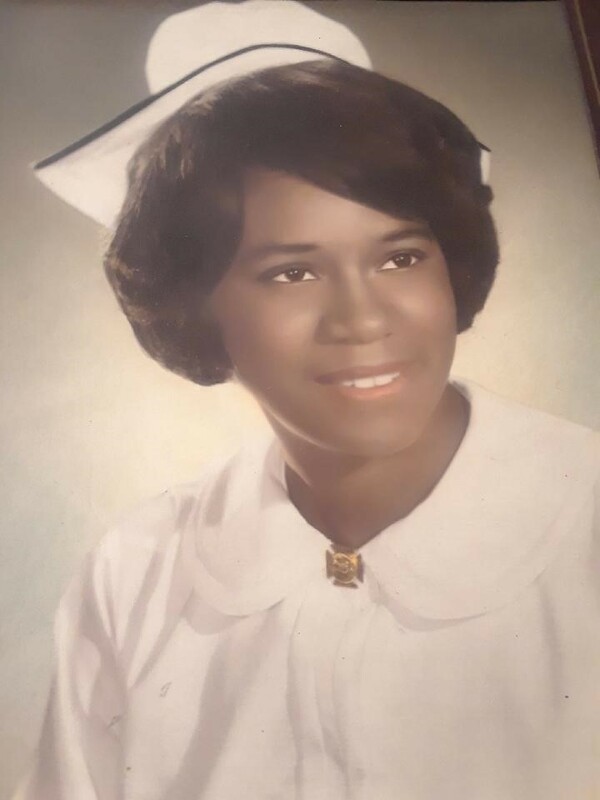 Shortly after graduating from Cathedral High School she entered Newark City Hospital School of Nursing, Newark, New Jersey; graduating in 1966. Sandy was commissioned as an Ensign into the Navy Nurse Corps in February 1967. After completing Women’s Officer School in Newport, RI, she reported to her first assignment at Naval Hospital St. Albans, New York. Her Active Duty assignments include Naval Hospitals Annapolis, Maryland, Newport Rhode Island, Roosevelt Roads, Puerto Rico, and Naval Medical Center Portsmouth (NMCP), Portsmouth, VA.
During her career she earned a Bachelor of Science degree, dual major, in Nursing and Business Management from Salve Regina University, Newport, RI in 1977. Sandy went on to earn master’s degrees in Public Administration, Information Systems, and Human Resource Management from Golden Gate University, San Francisco, CA. Transferring to the Naval Reserves in 1982, her assignments included Civilian Humanitarian Contingency Health System, Norfolk VA, Naval Air Reserve, Norfolk, VA, Operational Healthcare Support Unit, Det. S, Boone Clinic, Norfolk VA, Naval Air Reserve Unit, Sewells Point, Norfolk, VA and NMCP. A true team player, she selflessly supported Operations Desert Shield/Storm and Noble Eagle during mass mobilizations. Throughout her faithful years of service, she held numerous positions including, Equal Opportunity Officer, POMI Officer, interim Executive and Administrative Officer, and Commanding Officer for five years. After completing years of honorable service on both Active and Reserve Duty, she began her Civil service employment in October 1986 at Naval Medical Center Portsmouth and completed her career at Branch Health Clinic NAVSTA Norfolk in February 2019, where she retired. A founding member of the National Naval Officers’ Association (NNOA), she served as membership chairman and on numerous committees. She loved mentoring the junior officers who followed in her footsteps. Sandy remained active in the NNOA, serving as the Retired and Reserve representative at the time of her homecoming. Academy. Her hobbies included reading, travel, and crafts. She was predeceased by her parents Alexander and Catherine Garrison and her husband of 16 years, Edgar S. Pollard, DTC, USN (Ret.). Sandy is survived by her sister, HM1 Edna M. Garrison, USN (Ret. ), cousins Tenelle McCoy, Sarah Dodson, Bill Dodson, Iris Holmes, Sandra Flowers, Cecelia Sims, Adrea Higginbottom, Vernon Washington, the Pollard Family and special friends, CAPT Ed Gantt, USN, (Ret. ), CAPT Cecelia Dawe-Gillis, NC, USN (Ret. ), LCDR Sandra Whitaker-Hill, NC, USN (Ret. ), Dr. Denise Davis, Olethia Everett, Barbara Gibbs a host of cousins, friends, and her Navy family. A visitation will be held on Thursday, April 4, 2019 from 3-8 p.m. at Metropolitan Funeral Services, 120 W Berkley Ave, Norfolk, VA. A funeral mass will be held on Friday, April 5. 2019 at 10 a.m. at the Basilica of Saint Mary of the Immaculate Conception, Norfolk. Thank you for guidance and your sweet spirit. CAPT Pollard You were a Navy Nurse Corps Trailblazer. Thank you for leading the way for all of us. Thank you for being the kind, sweet person that you are. You were always willing and more than able to help. I am blessed to have worked with you and to have been able to call you my friend! To the family : Please know that you’re in my thoughts and prayers. My sincerest condolences for an incredibly great loss. I’ll never forget Sandy. I am grateful to have known Sandy. She had a beautiful and kind spirit always. Praying as God receives this beautiful angel, that those left behind will live with their memories of Sandy with joy. May God’s strength carry the family through this time. I pray that knowing one day you will see your beloved again will ease your sadness. Dearest Edna, we are here for you. Our shoulders are here to hold you up. You are loved. May God hold you in the palm of His hand. Alexandra was a good friend and a strong supporter of the NJROTC Program, Her dedication was enviable. I will always remember the times we sat and discussed the various issues that we faced during summer Leadership Academy. I will miss her gentle personality and talking with her. May GOD bless her soul and her family. Sandy was a great friend who was always willing to help someone. She had a strong code of honor and never judged people by who they were but by their competence and conduct. I remember one night when she was stationed in PR, I was there with my squadron and received a call about 7PM that I had a plane that diverted into Guantanamo Bay, Cuba and needed a part… I told the squadron I would fly the part to Guantanamo Bay. I ask Sandy if she would like to go and naturally, she said yes, so we put her in a flight suit, a torso harness and helmet and launched for Guantanamo about 10 PM. The flight was long but uneventful, and we returned to PR in time for Sandy to get to work by 7 AM. Later, Sandy honored me by inviting me to be her guest speaker when she retired from the Navy. Thank you Sandy for your time and effort that you dedicated to the Area 5 NJROTC program and cadets. It was a pleasure getting to know you and I was honored to have you work with our cadets at Leadership Academy each summer, along with your Corpsman, whom you mentored and instructed. You touched so many people in our small community but you had such a huge impact on the future of our young citizens. Rest easy and God Bless you. As the president of the National Naval Officers Association(NNOA) I wish to pass on the thoughts and prayers of all our members. We in the NNOA will be eternally grateful for her endless passion, compassionate vision, and steadfast leadership. She was a shining star and a guiding influence to many in the NNOA and the Sea Services. CAPT Pollard’s legacy can be seen in the many women and men of color who serve in the Navy and Marine Corps today. I had the opportunity to meet Sandy on a church bus trip to Washington DC to celebrate the 50th anniversary of Martin Luther King and we sat beside one another we talked the entire trip like we have been knowing one another for years and this was our first encounter. Sandy was a caring, kind, intelligent and gentle soul from that day on we kept in contact thru a text or call and we would see one another in church. Sandy’s love of traveling and attending events and helping others is a true inspiration. I would often run into her at Nordstroms after church where she would read her paper and have her She crab soup. My condolences to the family and many continued blessings. A true Gem is gaining her well deserved wings.